“The Council narrowed a list of almost seven hundred potential candidates down to the sort of…officials of their choice, based solely on who represents the regime’s interests,” U.S. Secretary of State John Kerry told reporters during a visit to Israel. What is that saying about glass houses and throwing stones? I think Kerry needs to redirect some of that anger and frustration back at home. Everything that Kerry is accusing Iran’s regime of doing, the United States is just as guilty. Kerry complains of an unelected body deciding who is allowed to run in the Presidential elections based on their support of the current regime. The US also has one such body, the Commission on Presidential Debates. This body was founded by and is currently run by Republicans and Democrats and operates with the goal to only allow Republican and Democratic candidates on televised debates. Its rules for invitations to the debates are set up in such a way that no alternative candidates are allowed to participate. This has a dramatic and negative affect on those alternative candidates. TV air time is important in elections. TV air time along side other candidates is even more important. It adds an air of validity to the participating candidates. If alternative candidates are not allowed to participate in the debates, it makes it easier to convince the public that those candidates are not serious or important. That would be true if not participating in the debate was the result of the candidate’s own actions. That is not how it works in reality. In reality, we have an unelected body making rules that actively exclude candidates it’s regime supporting rulers don’t want in the debates. Hardly a free, fair, open, accessible or accountable election process. Aside from that, many states have set up laws that make becoming a candidate as far from free, fair, open, accessible and accountable as possible. Take our state of Oklahoma as an example. Oklahoma has some of the worst laws in the US in regards to forming a new party and running a Presidential Candidate on the ballot. These laws have actively blocked legitimate alternative candidates from the ballot. 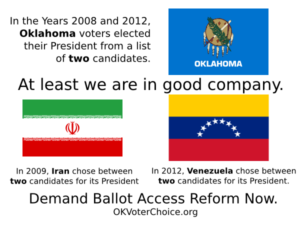 For the last three presidential elections, Oklahoma has been the only state in the US to limit its voters to two choices. The bar is set so high that without a lot of money from a national organization, you cannot form a new party or get an Independent candidate on the Presidential ballot. Even if a party qualifies and submits its candidate for President, the state has made up rules on the spot to prevent that candidate from reaching the voters, as can be seen this past election. Hardly a free, fair, open, accessible or accountable election process. Another state, Pennsylvania, also has rules set up that if your petition to place a candidate on the ballot is challenged and you lose, you have to pay the costs associated with that challenge, including the opposition’s attorney fees. This law adds hundreds of thousands of dollars worth of risk to petitioning in the state. This law has led many alternative parties to simply withdraw their petition the moment it is challenged, simply because they cannot risk that financial hit. Hardly a free, fair, open, accessible or accountable election process. These aren’t the only two examples but they work to illustrate the point. If John Kerry wants to lambaste a known oppressive regime for its unfair election process, perhaps he should look in the mirror and begin the process of cleaning house. Until the United States is operating truly free, fair, open, accessible and accountable elections, he has no right to complain about the actions of other nations. This entry was posted in Election Reform and tagged Iran, John Kerry, Presidential Elections. Bookmark the permalink.